Kite surfing with surf or pulling out a flask-sail, is surely one of the most innovative and exiting sports and to be practiced during the third millennium on the planet. coastal lagoons and lakes suitable for this discipline. I would point to the extraordinary development of tourism on the beaches of north-eastern Brazil, where small fishing villages live in symbiosis with hotels, camping and Pensions 'pousadas' - which are populated from April to January by international kite surf clans. The main elements for the practice of this discipline are water and wind. From both in our country we have in abundance, so let use them! Personally whenever windfinder.com or windguru.com predict wind over 10 knots, I go to the office with my equipments on the car, waiting impatiently for several hours in full freedom, among vibrant colors and strong emotions; in society, of a small but growing enthusiasts kite-surfer group. I must emphasize that this wonderful sport is part of the family of those activities that are highly dangerous if they come practiced without performing a special course by qualified instructors. Pursuing such a course is pre-condition to avoid fatal accidents. The practical side of kite-surf, combined with ease to advance acrobatics and vertiginous dances have given precedence over wind-surf, placing more and more people oriented towards the former practitioner. We need a board to surf in water, a belt (Harness) to hook that would then be captured the rod (bar), from where about 24m long fiber link with balloon (kits) built specifically for this order - which swell through a small pump in order to not to sink if it falls into the water. A handy tool is a small anemometer that can be kept in the pocket, to understand the intensity and regularity of the wind, which should be appropriate for the size of kite-sail to be used: the greater balloon, the less wind - and vice versa. Last but perhaps most importantly: never sail alone! Unfortunately, the kite-surfing practitioners in Albania for the moment can be count with two hands, some in Vlore, some in Durres, in Tirana and someone else elsewhere, however the desire is great and certainly within a few years it will completely change, giving pep to the beaches almost all year. The most suitable season in our country lasts from March until November. In the Netherlands, where practitioners are thousands, the summer temperatures are more than compared with our winter on the coast, so that, to Albania with a 5mm neoprene suit, even in winter temperatures can be exercised regardless. Dhermi beach in South, is one of the most beautiful places to navigate; however is difficult to find the right wind. On the other hand, in the Bay of Vlora, Orikum is quite interesting because very often different thermal fronts of wind descend from the heights of Çika mountain and Llogara Pass. If the wind blows from the West, the north beach of Zverneci in Vlora is a real miracle, as well as the Delta of Vjosa river beaches, are more suitable areas. ; While Divjaka seems is “built” for this discipline, with extensive sandy beaches. 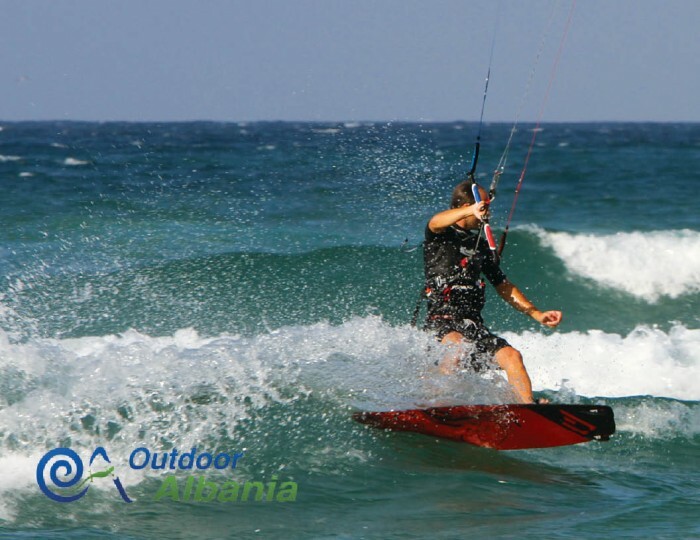 Near Durres and the capital, the “Lalezit Bay, especially in the northern beach, Bisht Palla, is a perfect terrain for beginners, because it is shallow and the wind almost always blows in the right direction constantly. In the North we have the beaches of Shengjini, and Velipoja, though admirable nature, even if the wind often comes to blur the mountains nearby. All the above beaches are abundant in sandy areas which are necessary for the preparation of materials and lowering the balloon away from dangerous objects and pedestrians or sunbathers, because the sails have attractive force and very big lift. It would be good for local authorities to create some special area for practicing and promoting this culture as they do in neighboring countries, It is time to kite surf! Eksplorues dhe ushtrues i sporteve te natyres si rafting, kayaking, skiing, kite-surfing etj, me kompanine e tij Outdoor Albania. OA eshte nje nga kompanite me te spikatura qe ushtron aktivitete dhe ture me natyre aventureske ne Shqiperi. 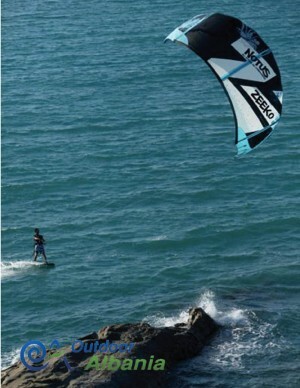 Hello, do think that Lukove is good for kitesurfing? Nice beach but I do not know if the wind is ok in Summer? Hello Ludovic. It depends from the period. The spring is better than the summer for kitesurfing we think. Hi! Is it possible to take a kite surfing course (one day) near Saranda, please? Përfundon me sukses projekti "Si të bëhemi një udhërrëfyes i mirë turistik"